GALVANIZED STEEL FLEXIBLE CORE w/LIQUID-TITE PVC JACKET; TRADE SIZE 1-1/4 In. 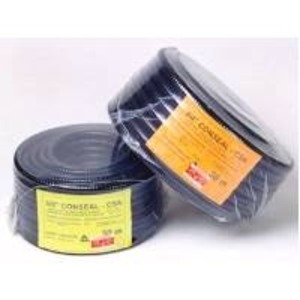 ; METALLIC LIQUID-TIGHT FLEXIBLE CONDUIT; ANAMET CANADA INC.; CONSEAL - CSA; CSA/UL APPROVED; METER; 75; UV (Sunlight) Resistant; BLACK; FT-4 RATED; 1.66 In. (42.2mm) O.D. ; 1.380 In. (35.05mm) I.D. ; MINUS 20 Deg. C Min. ; 75 Deg. C Max.